Branding upgrades are the quickest and easiest way to uplevel your company’s online image. Here I share 3 quick and easy upgrades, plus we give you a FREE customizable, downloadable graphic design cheat that you can use JUST for your brand. Get your Graphic Design Cheat Sheet here! Get instant access to our free, customizable templates, PLUS access to graphic designer information from designers I personally recommend! You can access our free, editable, graphic design cheat sheet here. And if you want to work with designers I personally recommend, you may reach out to Heather Bartlow of Heather Bartlow Designs. 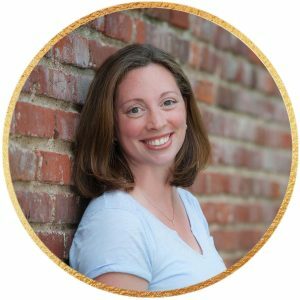 “Hi I’m Kelley Sanabria, the founder and CEO of Femworking. I help female entrepreneurs who are overwhelmed with the pieces of running their business, to skip the entrepreneurial learning curve, partner with other women, and grow their businesses faster. In this video I’m going to give you my BEST tips for upleveling YOUR brand through graphic design. I’m going to show you how to have an upleveled LOOK, without the upleveled COST. For years I struggled with crappy design. My brand wasn’t cohesive – or pretty for that matter! And when I look back on my old branding I can see that as much as I was trying, my branding was JANKY. It didn’t look professional. I’m proud of our current branding, and if I can do it, I know you can do it. And I want that for you! One of the biggest mistakes I see is entrepreneurs missing out on valuable sales opportunities because their branding is not up to par. You know a good website when you see it, right? If someone hands you a business card you immediately know whether the design is good or bad, right? You know instantly whether it’s high quality or cheap. You know it instantly, and it’s the same for your customers. They get an impression about how serious you and your business are based on your branding and design. There are all of these little design rules and principles that we subconsciously use to evaluate someone’s branding that lead us to conclusions about their business. Here are three simple upgrades you can make to maximize your graphic design and branding efforts so that you don’t turn potential customers off with silly mistakes. Number one: I see entrepreneurs using color in the wrong proportions, or colors that just don’t look good together. A good rule with color is the 60/30/10 rule. 60% your main color, 30% your secondary color, and 10% an accent color. 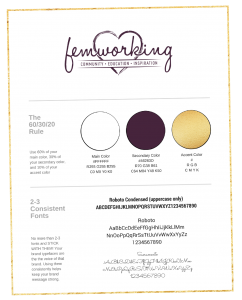 For us here at Femworking, that would be 60% white, 30% our signature deep purple color, and 10% the metallic gold that you see. We try to use this pretty consistently as we design, and you’ll notice this ratio if you start paying attention to other companies’ branding too. So no more than 2-3 colors, and while we’re at it, please pick just 2-3 fonts and STICK with them! Lots of different fonts is another deal breaker for your customers. Keep your brand clean and cohesive. Having your color proportions off or using too many fonts can scare off your potential clients and customers. They just subconsciously know something is wrong with your website. It doesn’t give them a good feeling. They won’t want to trust you. So look for ways you can implement the 60/30/10 rule on your website, your product packaging, your proposals, – everywhere – so that your brand is visually pleasing. People will like and trust you. You can see that I took a sheet of paper and wrote my signatures three times each. Then I picked my favorite by indicating 1, 2, or 3, so my designer knew which one to choose to work with. You can find people to do this for you on fiverr or etsy. And when you sign up for our free graphic design cheat sheet I’ll give you the contact information for my favorite design people as well. These are my own personal recommendations. The third thing you can do to uplevel your branding is to have a designer make you a custom package. I’ve worked with my designer to create custom slide decks, worksheet templates, and even design elements. This is a bit more of an investment, but it’s still TOTALLY doable. It’s an investment that I really believe in. We use our worksheet template ALL the time. And while it was work to create it up front, once it’s done you have it to use indefinitely. We also have custom slide decks that we can use for all of our courses that we create. You can find designers to do this, but if you download the cheat sheet you get my personal recommendations. Next, you want to make your cheat sheet available to your team, like your VA or your designer. You can even put it as your computer wallpaper or share the file through google drive. I always kept a copy in my desk drawer so I always had easy access to my color’s hex codes. PicMonkey and Canva can save you a lot of time, especially if you don’t know Photoshop. Now comes the fun part. We’ve shared with you and now we want to know what tips and tools you use! Please leave us a comment and let us know! And remember that sharing is caring so share this with your biz besties – they’ll love you for it, I promise. And don’t forget to get yourself your graphic design cheat sheet. You’ll get it instantly and it will also tell you how you can work with my recommended graphic designers. For more branding help, check out the Femworking School of Entrepreneurship, where we spend one whole month helping you define your brand, identify and tell your unique story and define your niche clients. We help you figure out who you are and then guide you to confidence so you can stand powerfully in your own brand. We teach you social media and website branding and we give you everything you need to have branding that will help you magnetize your ideal clients and then give them the confidence to buy with you. So if you’ve been looking for an affordable place to learn, and you want to join an amazing community, check out the Femworking School of Entrepreneurship. Please make sure to subscribe to me on Youtube, and feel free to share this video on your favorite social media platform. I love connecting with you so please hit me up on Twitter at @kelleysanabria and @femworking and you can find us over on Facebook, too. Thank you so much for watching!